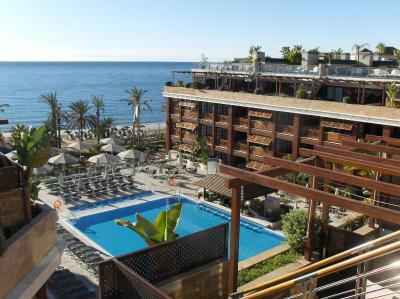 Lock in a great price for Gran Hotel Guadalpin Banus – rated 8.3 by recent guests! 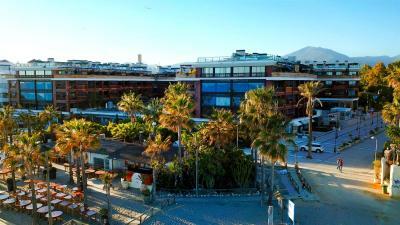 Fantastic rooms, fantastic staff, 10 minutes walk from Banus. Everything was amazing. 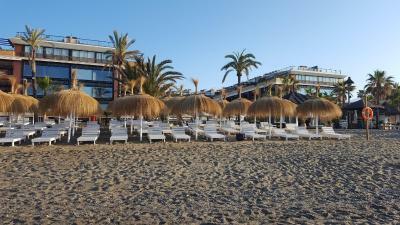 Will be our go-to hotel in Banus from now on. Everything. Second time and Will come back again. Location, Location, Location! Amazing staff service, fantastic breakfast, awesome location, decent prize. They host Premiere League football teams and the ambience in the hotel is quite special. The location of hotel is good. The rooms are clean and the view of room is nice. 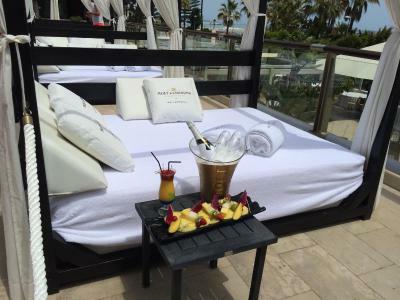 Very lux room with nice sitting area, cool bar area, and bathroom as well as a large fantastic balcony overlooking the pool and beach. The pool and beach area really nice. 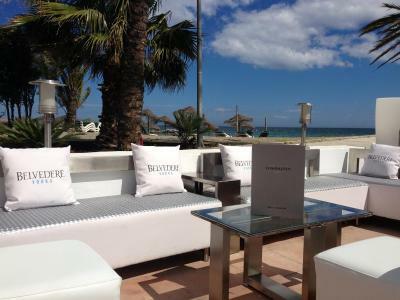 The breakfast buffet was fabulous with so many food choices to enjoy outside on the beach. The Hotel was a good location. Italian Restaurant downstairs and the Breakfast is probably the best thing the hotel has to offer. Simply a great deal and great value for the money. 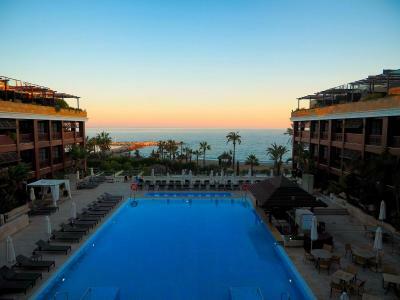 Its a great hotel with a fantastic location. Probably will need a full refurb in the coming years but it is kept very well. 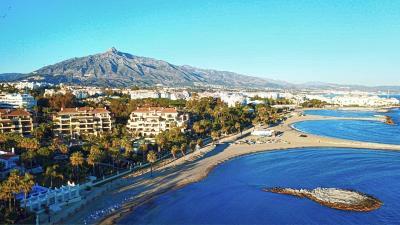 Wonderful location - away from the frentic crowds of Marbella and right on the beach. Classy end of town - no high rise. 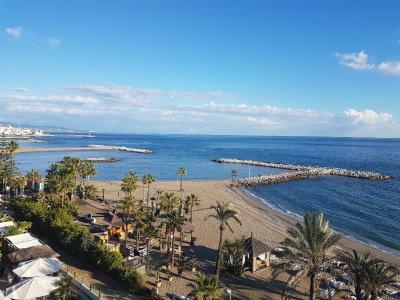 Gran Hotel Guadalpin Banus This rating is a reflection of how the property compares to the industry standard when it comes to price, facilities and services available. It's based on a self-evaluation by the property. Use this rating to help choose your stay! 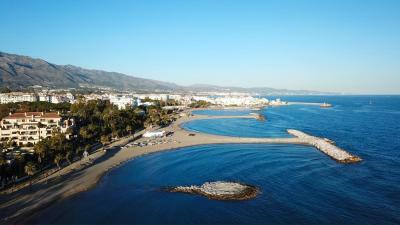 One of our top picks in Marbella.Gran Guadalpin Banus has direct beach access and is a 15-minute walk from the center of Puerto Banus in Marbella. 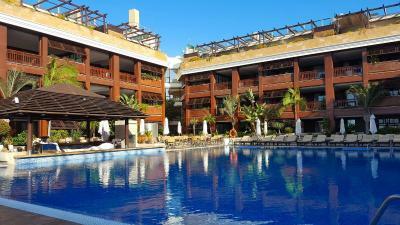 It offers an outdoor pool, sauna and steam room, gym and free Wi-Fi. 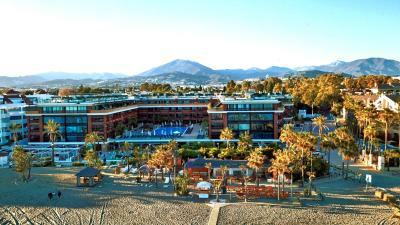 All air-conditioned rooms at Gran Guadalpin Banus feature flat-screen TV and a CD player. 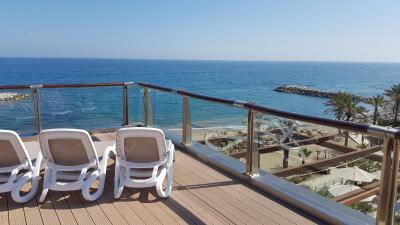 All have a private balcony, some with sea views, and the bathroom comes with a hairdryer and trouser press. 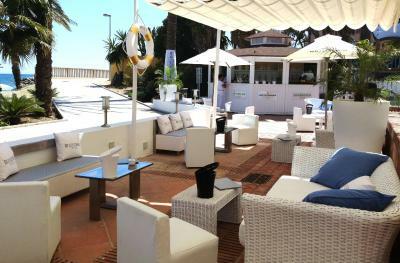 The complex has a beach club and a poolside sunbathing terrace. There is also a play area for children. 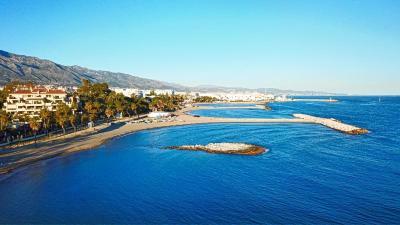 Gran Guadalpin Banus has a range of places to eat, including seafood, international and Basque restaurants. 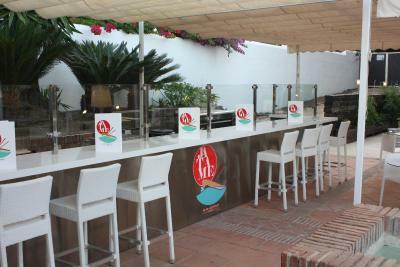 There are also bars offering drinks, snacks and cocktails. 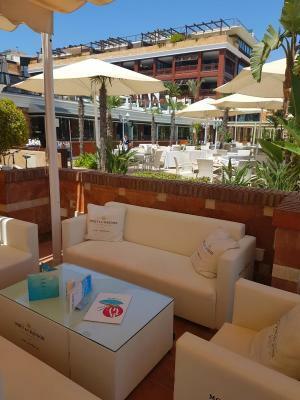 There is a 24-hour front desk, and Gran Guadalpin Banus's golf department can help with booking rounds at local courses and arrange golf classes. 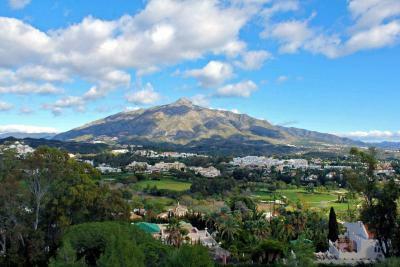 The lively Marbella can be reached in 15 minutes by car. 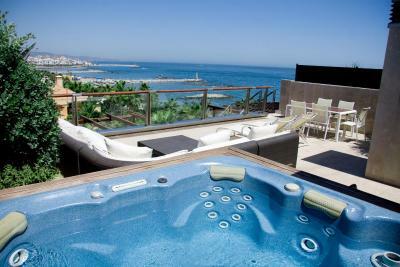 When would you like to stay at Gran Hotel Guadalpin Banus? 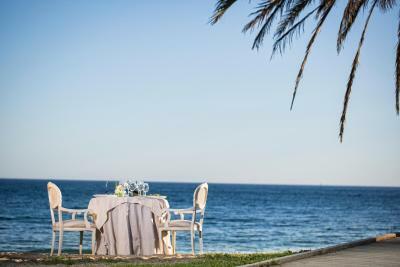 This room has stylish furniture, 2 single beds and a furnished terrace with views of the Mediterranean Sea and/or swimming pool. 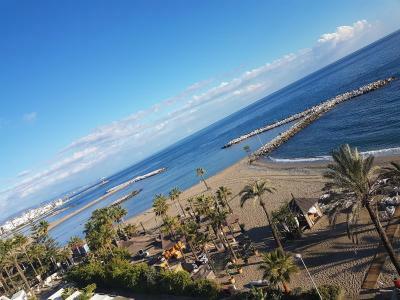 Offering views of the Mediterranean Sea or swimming pool from its private furnished terrace, this suite has a small kitchen, a lounge with a dining area and 1 single bed. The bedroom has 1 double or 2 single beds and includes an private bathroom with a spa bath. Set on the top floor, this suite with Mediterranean views has a kitchen, lounge and large furnished terrace with a hot tub and sun loungers. 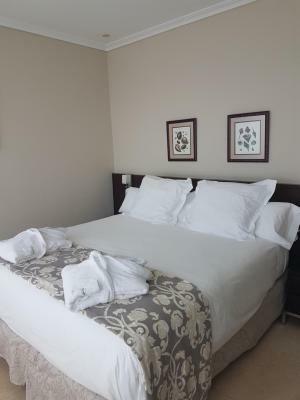 The bedroom has 1 double or 2 single beds and includes an private bathroom with a spa bath. With a private furnished terrace, this suite has a small kitchen and a lounge with a dining area. The bedroom has one double or 2 single beds and includes a private bathroom with a spa tub. 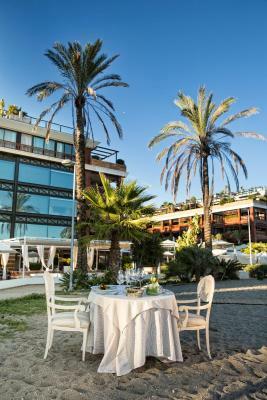 With views of the Mediterranean Sea or the swimming pool from its private furnished terrace, this suite has a small kitchen and a lounge with a dining area. 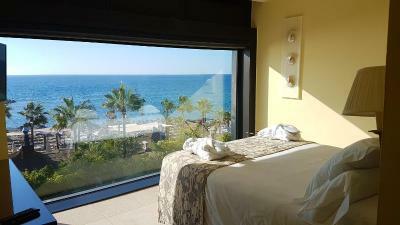 The bedroom has one double or 2 single beds and includes a private bathroom with a spa tub. 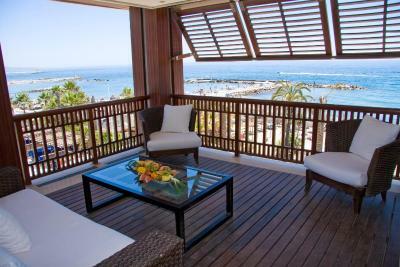 This air-conditioned room features a private furnished terrace with views of the sea or the pool. It includes a double bed, a flat-screen TV, a desk and a minibar. The private bathroom includes a hairdryer and toiletries. 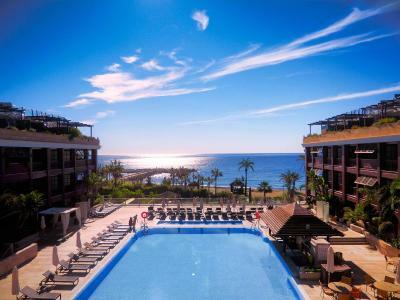 This spacious apartment features a twin bedroom and a double bedroom, with private bathrooms. The lounge comes with 1 single bed, flat-screen TV and a CD player. 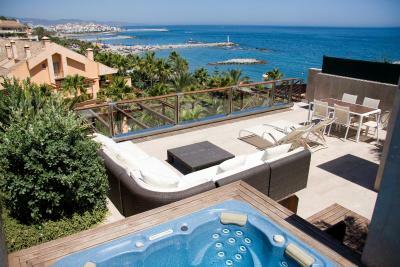 There is also a private furnished terrace with views of the Mediterranean sea or the swimming pool. The kitchen includes a hob, microwave and dishwasher. The bathrooms feature slippers and a hairdryer and one of them also includes a spa bath. This air-conditioned family room features 1 double bed and 2 single beds, as well as 1 private bathroom with a shower, hairdryer and slippers. The kitchen area is equipped with a hob, microwave and dishwasher, and in the living space you will find a sofa bed, a flat-screen TV, and a CD player. This suite features a CD player, air conditioning and sea views. The bedroom has 1 double or 2 single beds and the living room comes with 1 single bed. This basic air-conditioned double room comes with a flat-screen TV, desk and mini-bar. The private bathroom includes a hairdryer and free toiletries. This suite has air conditioning, CD player and spa bath. 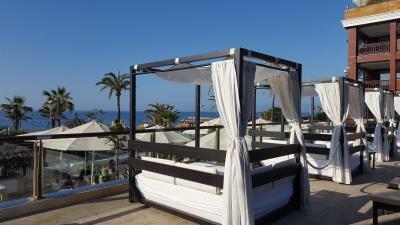 House Rules Gran Hotel Guadalpin Banus takes special requests – add in the next step! 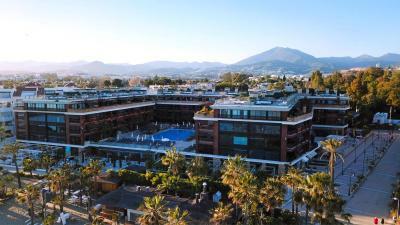 Gran Hotel Guadalpin Banus accepts these cards and reserves the right to temporarily hold an amount prior to arrival. 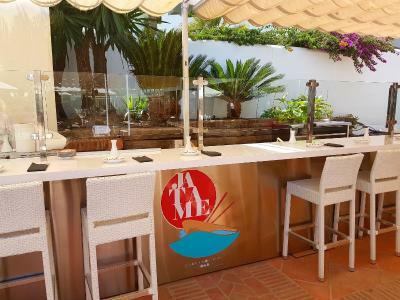 Please note that, if you are not the owner of the credit card used to make the reservation, you must email a copy of the credit card, a copy of the passport or ID, and a signed copy of authorization from the cardholder for the total amount of the reservation. I loved the location. The porter was so nice. The cleansers were lovely. 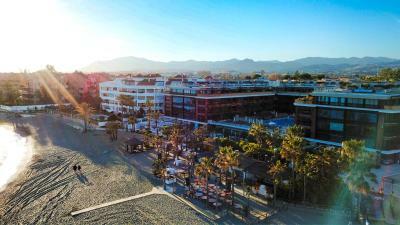 A bit far from Old Marbella, but if you just want to relax and disconnect from everything, its perfect. Everything was great. 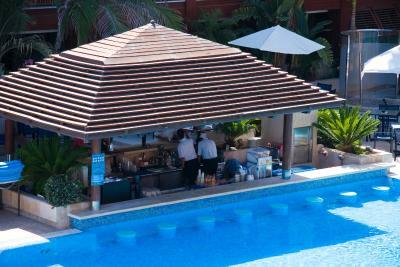 Staff we're excellent, very helpful, professional, polite and always in a good mood. The view was amazing, the beach pool and restaurants all great. Breakfast was very good. Great selection. Lovely pool. Breakfast as always superb. Staff always friendly... 4th or 5th time staying here. Says it all really. Crosoints were not crispy and flaky and fresh. The TVs were small and entiqueted. Poor reception and picture quality. Fresh fruits at breakfast. Vegetarian omlet was excellent. The chef went extra mile to get fresh green chillies. Brasserie was very disappointing. Not 5 star quality. I noticed most dinners left more than 1/2 plate uneaten. I am a fine dining enthuseast and sampled all over the word, this was the worst. The complexity of the lightning system in the room. Before you witch off the desired light , you have gone through the total program! The kindness of the personnel while check in and other inquiries where all have been very helpful . The valet service was above expectation where kindness is concerned. Modern, great breakfast, helpful staff.